Having established her fragrance empire, Jo Malone recently stepped into the world of television in 2010, presenting High Street Dreams on BBC 1. 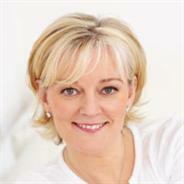 The passion, inspiration and flare for business that she conveys on screen were the foundations of her globally recognised brand: Jo Malone, and earned Jo an MBE for her services to the beauty industry in 2008. Jo began her career as a facial therapist and in the early nineties created her first product; a nutmeg and ginger bath oil, which she hand-mixed at home and gave to her clients as a thank you gift. The bath oil was an instant success and demand for Jo’s products became so strong that she and her husband Gary took the leap from kitchen table top and opened their first store in London’s fashionable Chelsea in 1994. Overnight, 154 Walton Street became a destination store for fragrance devotees from around the world, trying to be part of this cult brand. The Jo Malone brand was acquired by Estée Lauder Companies Inc. in October 1999. Jo remained Founder and Creative Director, developing products and constantly challenging convention, which firmly established her as an innovator within the beauty and lifestyle industry. Jo spearheaded the worldwide positioning of the Jo Malone brand until January 2006 when both she and her husband Gary left the business. Jo made her television debut with the four part series High Street Dreams. Conceptualised by Jo herself, the series saw her back in the tough world of retail, using her business experience and entrepreneurial spirit to help small businesses realise their dreams of trading on the great British high street. In addition to High Street Dreams, Jo has also appeared on BBC Breakfast, LK Today, Working Lunch, Loose Women, BBC Radio 2 and BBC Radio 4.